Hello once again for another Daredevil review. I took last issue off in case you hadn't noticed. Frankly, it was the perfect time to do it, because not much happened last issue. 597 had bad art work with a boring here is the states quo going forward story. The only interesting bit was the cliffhanger. which was, 'Muse has escaped the Inhuman prison!' 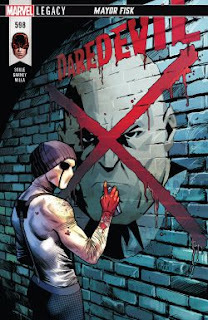 Muse is one of the few things Soule has added to the Daredevil mythos that I have enjoyed in this run. With him out on the loose again I have to admit I am slightly excited. Let's see how this plays out. 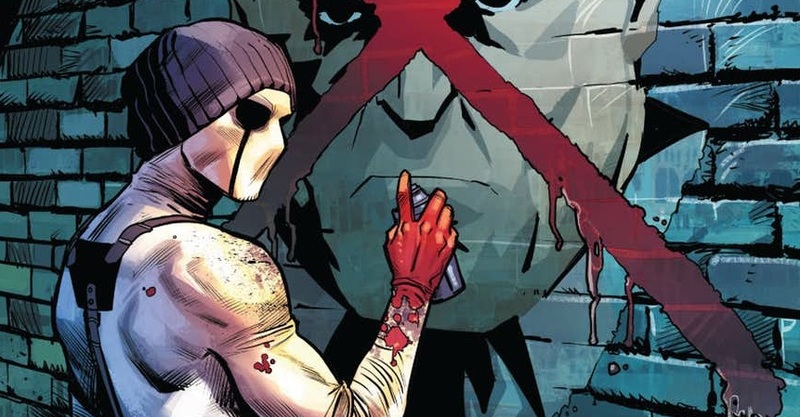 We open to see Muse has continued on with his Banksy like hi-jinx from last issue. We find out, from the expositional news network, that he has painted five more murals on very big skyscrapers around town. Now there are six skyscrapers in total that show images of different superheroes that operate in New York City. 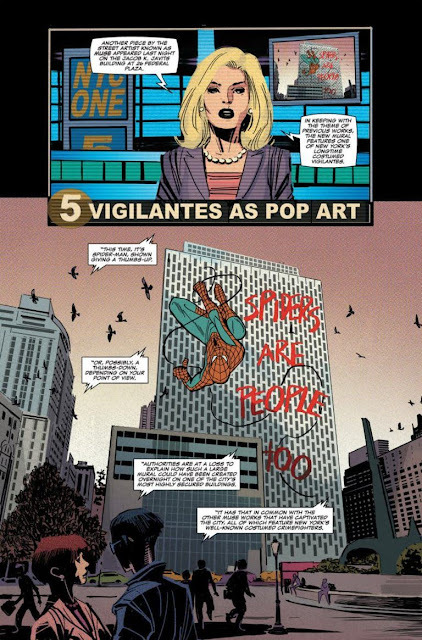 ( Luke Cage, Spider-man, Iron Fist, Moon Knight, She-Hulk, and Daredevil) Everyone of these murals also come with their own personalized slogan offering a counter point to Mayor Fisk's war against vigilantism. The artist, Muse, is an Inhuman psychopath from early on in Soule's run. Now Mayor Fisk wants him found, captured, and brought to him. 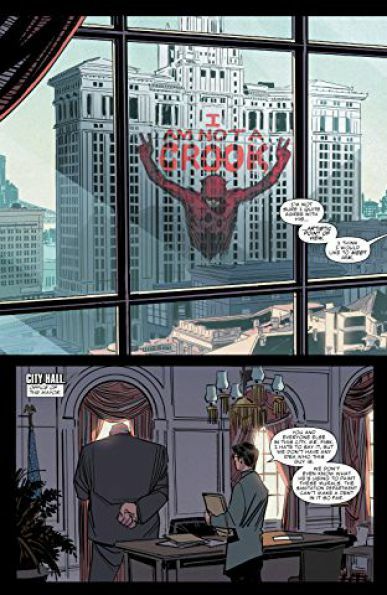 Deputy Mayor Murdock is in his own office tuning out his assistant in order to listen in on Fisk's conversation with Wesley. Matt thinks quickly of a logical reason to get into Fisk's office to coerce Wilson into not sending the cops after Muse. Matt tells Fisk he should send some of his 'Superhuman contacts' after Muse. This does not go over well with Mayor Fisk. He threatens Matt with possible indictment on conspiracy charges. Matt still pleads once more saying to Fisk, "People are going to die Fisk." To which Fisk replies' "People die every day." Desperate for more information as to what Mayor Fisk is up to Matt planted an ultrasonic bug on Wesley. As Daredevil he tracks Wesley down. He over hears Wesley as he goes to crime bosses all over town offering them jobs in the city government. Hammerhead, Black Cat, Owl, and Diamondback are all told to be at the meeting at Sarnos in the Bronx Saturday. We then jump to our cliffhanger, Muse. He is painting another mural this one is in the Meat Packing district, on a rather diminutive building. He is finishing a mural of the Punisher. When two very dumb girls approach the masked painter, that has blood streaming down his blackened out eyes, and ask for a photo. Oddly, Muse more then happily obliges them. We find out Muse doesn't show up in the photo, and then Muse starts repeating, "you are pretty" till the girls finally understand this dude is creepy. Before Muse is able to slice, dice, and toss their salads the cops show up. Six officers in total, and to get away from the police Muse does...something. I have no clue how but he murders them all. I have read every appearance of Muse, and really, I can barely tell you anything about this character. He can do a noise vortex thingy that messes with Daredevil's powers. I guess he is really fast, because he was twenty feet away from six cops with guns drawn and only one shot was fired. He doesn't show up in photos. And apparently No One except Daredevil and Blindspot remembers he attacked a courtroom and kidnapped a Judge in broad daylight. This involved hundreds of witnesses! Charles Soule continues his systematic destruction of the characters I enjoyed at the beginning of his run on Daredevil. One can only hope this is the precursor to his leaving the title for good.